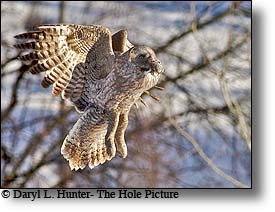 The most common is the Great Horned Owl which is one of the most widespread owls in North America. 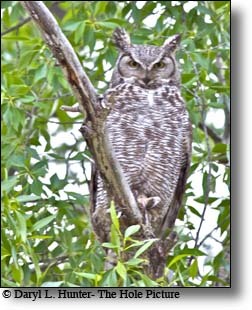 Great Horned Owls can vary in color from reddish brown to a grey or black and white. The underside is a light grey with dark bars and a white band of feathers on the upper breast. They have large, staring yellow-orange eyes, bordered in most races by an orange-buff facial disc. The name is derived from tufts of feathers that appear to be "horns" Great Horned Owls hunt by perching on snags and poles and watching for prey, or by gliding slowly above the ground. From high perches they dive down to the ground with wings folded, before snatching prey. Their prey is usually killed instantly when grasped by its large talons. 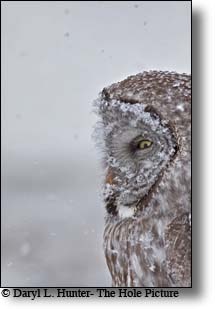 The Great Grey Owls frequent the area and may be found in the boreal forest. 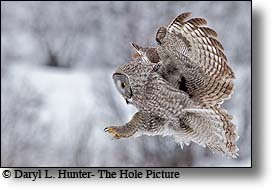 Great Gray Owl feeds on small rodents like mice and squirrels. 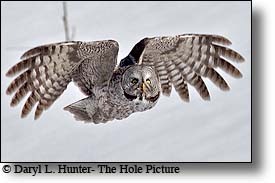 They have a wingspan up to 60 inches, bud despite its massive wingspan the great gray owl is mostly fluff and weighs only two to three pounds. 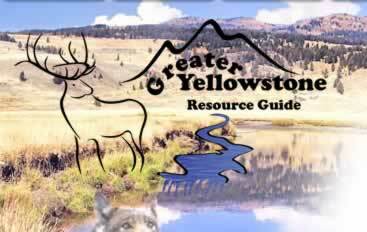 It is a year-round resident of secluded wilderness areas, preferring coniferous forest mountainous areas of the region. 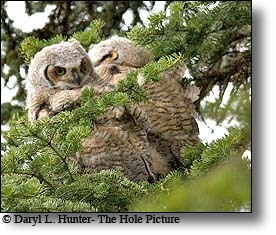 They often nest in abandoned hawk and eagle nests or on tree stumps. 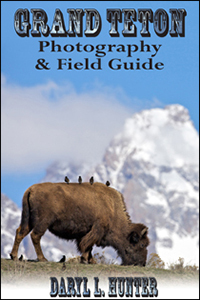 Breeding pairs in North America successfully fledge 70-80 percent of their young. 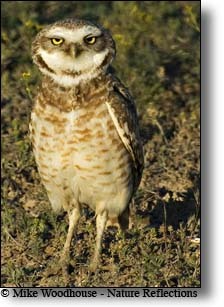 Burrowing Owls are a small ground-dwelling Owl with a round head and no ear tufts. They have white eyebrows, yellow eyes, and long legs. The Owl is sandy colored on the head, back, and upper parts of the wings and white-to-cream with barring on the breast and belly and a prominent white chin stripe. Burrowing Owls feed on a wide variety of prey, changing food habits as location and time of year determine availability., Small mammals, such as mice, rats, gophers, and ground squirrels comprise a large portion of their diet and large arthropods, mainly beetles and grasshoppers are also important food items for Burrowing Owls. 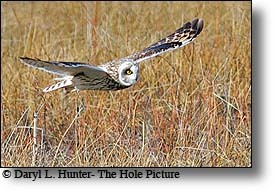 Short Eared Owl On the hunt. The Short-eared Owl is a medium-sized Owl. The plumage is brown with dark streaks on the chest, belly, and back. Males tend to be lighter in color than females. This coloring provides good camouflage, but if this fails, a Short-eared Owl will feign death to avoid detection. The yellow eyes are circled with black and set in whitish or buffy-white facial disks, which are suffused with a ring of brown. 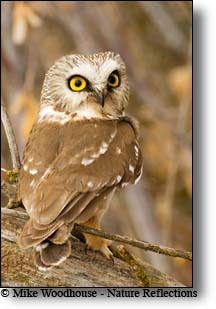 The Boreal Owls also known as the Arctic Saw-whet Owl, Richardson's Owl, and Funeral Owl frequent the area has a body length of 8 - 11 inches, a wingspan of 19 - 25 inches, and weighs 3 - 7 ounces. This owl is strictly nocturnal except during the 24-hour light during the summer at the northern extent of its range. This owl feeds on small mammals, birds, and insects, and can detect its prey under debris or snow by using its acute hearing. They form pair bonds that only last one season. Depending on the prey population. 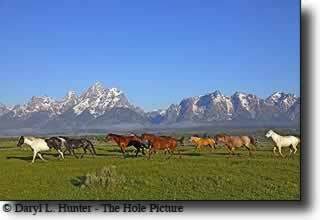 Individuals in search of food move south beyond the species range. They nest in woodpecker holes, other natural tree cavities. The females lay three to six eggs. During high prey years, this owl may lay more eggs per clutch or have more than one clutch in a season. Long-eared Owls preferred habitats which include dense vegetation close to grasslands or shrub lands, as well as open forests.they roost and nests in trees by day and hunt in open areas by night so are rarely seen. Long ear tufts identify long-eared owls, Great Horned Owls are the only other large owl with ear tufts, but long-eared owls are smaller and more slender than the great horned owl. Long-eared owls have brownish bodies with heavy barring and streaking on breast and belly. Their facial disk is rust-colored. The ear tufts are close together, long, black, and reddish brown, and are not visible in flight. As with the other "eared" owls, these are just tufts of feathers sticking up on top of their head. Owls' real ears are just holes on the side of the skull under the feathers and are offset, with one side higher than the other. The facial disc is reddish brown with white a patch below the bill. The Northern Pygmy Owl is a tiny, woodland Owl, an active daytime feeder that is most active between dawn and dusk. They have grayish or brownish or reddish upper parts and a light belly that are boldly streaked with brown. The head and nape are liberally sprinkled with whitish dots.